This recipe, which SAVEUR contributor Yewande Komolafe received from a French boulanger, produces intensely-flavored cookies that have a crunchy caramelized exterior and a chewy, amaretto-flavored interior. They're a tasty treat to have on hand when guests drop by for a quick cup of tea — they're quick to make, and also keep beautifully in an airtight container at room temperature. Be sure not to over-mix the dough, or the macaroons' characteristic texture will be lost. 1. Preheat oven to 375°F. Combine the almond paste, sugar and salt in a large mixing bowl and, using your hands, knead together until mixture is just incorporated. Add in the liqueur and gently work it into the paste to form a smooth dough. 2. Sift the powdered sugar into a mixing bowl. Using a ½ oz. metal scoop, scoop out individual portions of the dough and place each in the bowl of powdered sugar. 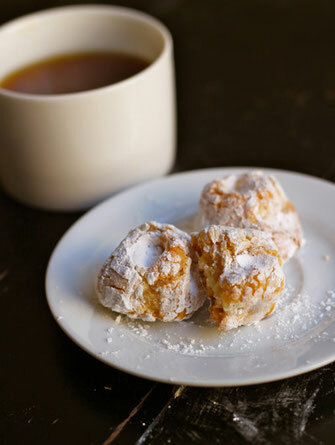 Coat each ball completely with powdered sugar and place on a parchment-lined baking sheet, leaving a 1-inch space between each macaroon. Pinch together the sides of each macaroon with your fingers and thumb, leaving a finger-indented well in the center like a little volcano. Let the macaroons sit out for 20 minutes to dry out. Bake until golden brown, about 10–12 minutes. Remove from oven and let cool completely. Serve immediately, or store in an airtight container. Note: Almond paste is similar to marzipan but contains less sugar and no fillers. (Some versions of almond paste do contain cream or eggs; to make this recipe vegan, ensure that your almond paste contains no eggs or dairy.) Marzipan will not work for this recipe.